Lock in a great price for Elite – rated 8.5 by recent guests! Tidy, clean, comfortable. Daily housekeeping. Fantastic breakfast! Super big bathroom, super big balcony, excellent breakfast. Friendly staff, near the train station, nice fresh air. Helpful and friendly staff. There were some glitches during our checkin, but the lady at the frontdesk helped us sort it out in no time. There are bread, ham, egg, fruits, cereal in the breakfast. Great place to stay! Excellent and friendly staff. Wonderful and big tub in room. Nice location convenient to train. Good breakfast. We really enjoyed our stay here and would stay here again! Zermatt is a great place to visit. The breakfast was nice and the internet signal was strong in the room. 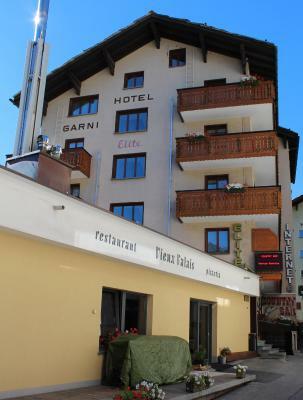 The hotel is in a very good location to the train station and bus stop for the ski lifts. There is also a supermarket only 50m away. Located In the center of the village, very comfortable and clean, recomend you the suite room with a jacuzzi and beautiful view from it to the village, not to forget the best breakfast you will have, enjoy!! The staff knew enough different languages(our staff member said she could speak 5) to be able to us and other guests to know what we were talking about. Were very helpful on what to see and where to go. Told us if we went up to the Matterhorn on to go only halfway then get out and walk around to enable us to get use to the altitude then go up to the top. We shopped in some of the local stores, like a hardware and meat store, prices were better in them. Elite This rating is a reflection of how the property compares to the industry standard when it comes to price, facilities and services available. It's based on a self-evaluation by the property. Use this rating to help choose your stay! 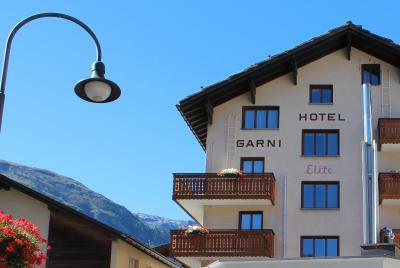 Hotel Elite is close to Zermatt's train station, the Gornergrat Cable Car and the Sunnegga Funicular. The ski bus to the Klein Matterhorn area stops 2 minutes away. All rooms offer free Wi-Fi access. 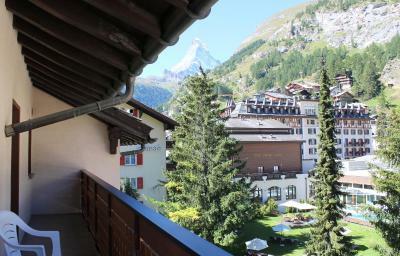 All rooms have a balcony and some offer panoramic views of the Matterhorn. They are also fitted with a cable TV. 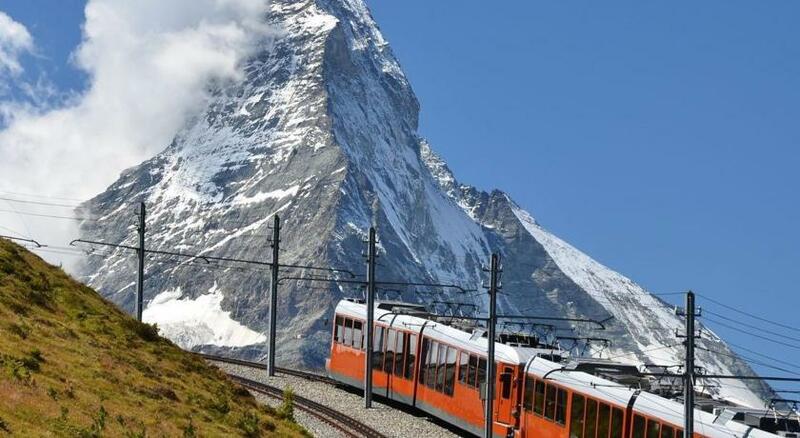 The cable car can be reached in 0.6 mi, while Zermatt's train station is only 1,000 feet away. When would you like to stay at Elite? House Rules Elite takes special requests – add in the next step! Free! One child from 0 to 1 years stays free of charge when using existing beds. One child from 0 to 2 years is charged CHF 10 per person per night in a crib. Cash Elite accepts these cards and reserves the right to temporarily hold an amount prior to arrival. Elite accepts these cards and reserves the right to temporarily hold an amount prior to arrival. Please inform Elite of your expected arrival time in advance. You can use the Special Requests box when booking, or contact the property directly using the contact details in your confirmation. Decor is a bit dated. Pretty bad value and very noisy. Stuff nice and ready to help. The supermarket and main street are all nearby. Breakfast has soooo much choice and it's tasty. Clean functional rooms turned down every day. 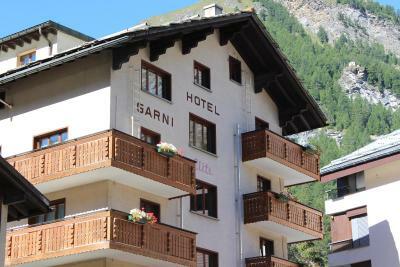 Comfortable size, minibar and nice balcony with lovely view of the Matterhorn. Nice selection at breakfast with hot option (eggs usually). Perfect location, very clean, good breakfast. Great view (even from the bathroom :) Good breakfast. 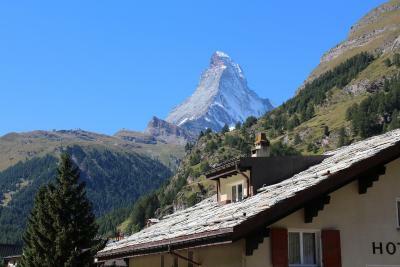 I liked everything but specially the stunning view of the Matterhorn from my room. Great place! A classic little Swiss place, nothing fancy. Clean comfortable beds, great breakfast, very kind staff and excellent location in town. No coffee/tea making facilities. No safe in room for valuables & the our mattress was uncomfortable. Location was good - walking distance to train station & in the centre of the town.